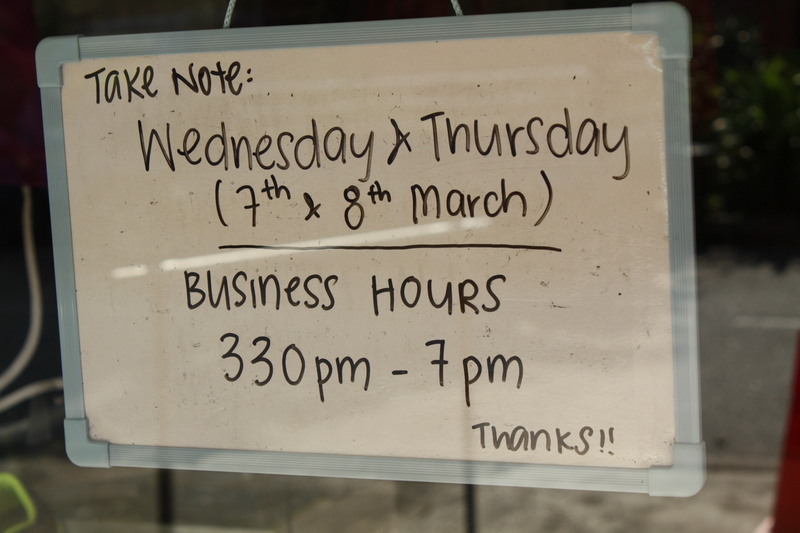 If you’re thinking of spending your public holiday with us, please take note of our business hours this Thursday! 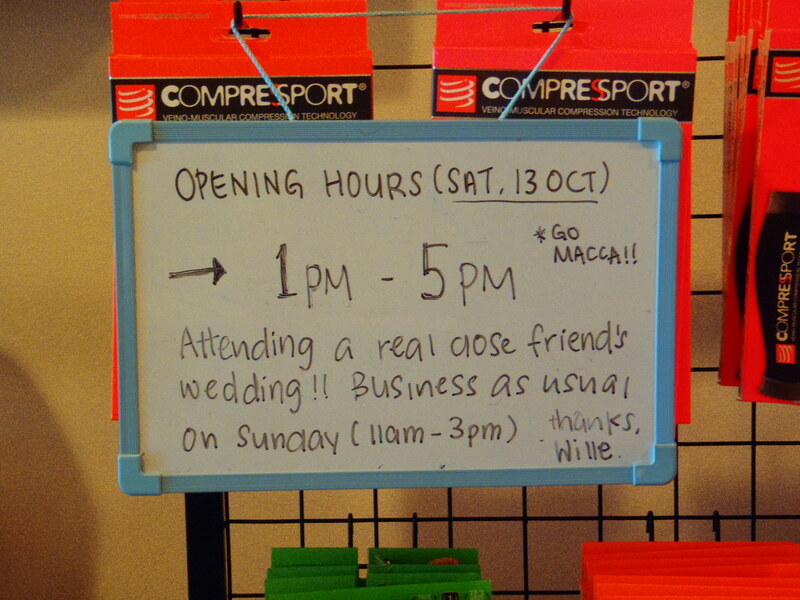 Slight change to our operating hours tomorrow, Saturday, 13 Oct 2012. It’ll be business as usual on Sunday (11am – 3pm). We also have other things that complement nationalistic pride very well. Please take note that there is a slight change to our business hours, but only for THIS Friday (25 may) and Saturday (26 may). We’ll be at product training in the morning. We’ll be out at events in the afternoon and evening. Sorry for any inconvenience caused! It’ll be business as usual on Sunday (11am – 3pm). Two important things in this update! 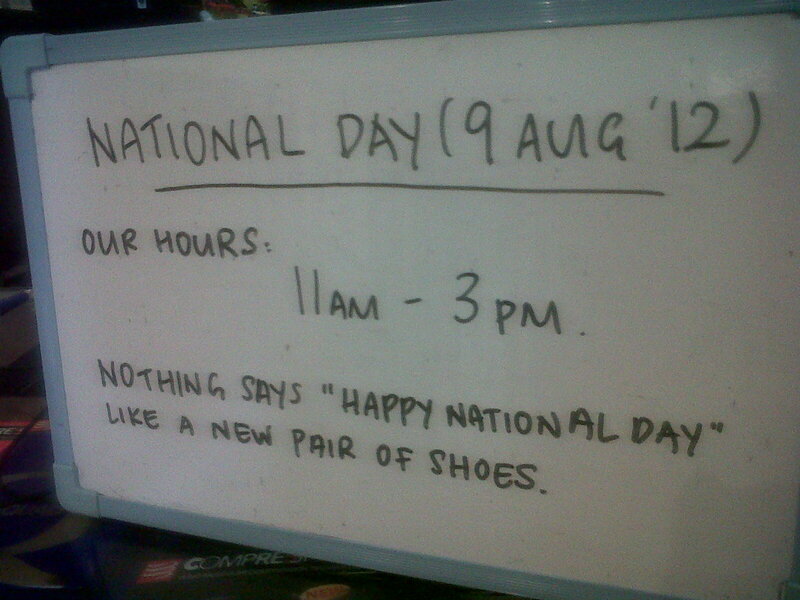 Lots and lots of great shoes on offer tomorrow so be sure you check out the update and come hang out tomorrow! 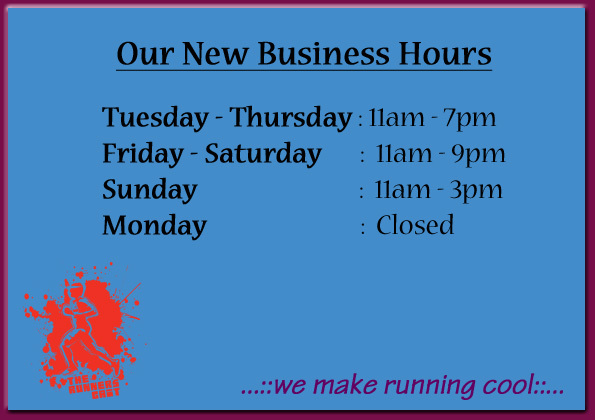 Please take note of a slight change to our hours for the next 2 days! We’ll be corporate health & sports events on both days, so we’ll see you in the afternoon! Sorry for the inconvenience and thanks for your understanding! See you in the afternoon! Hello one and all, hopefully the new year at work has been treating you well. You’ve spoken and we’ve listened – we’ve extended our business hours on Fridays and Saturdays to 9pm! Our New Hours – more time for you to hang out at the store! The Runner’s Gait would like to wish all our Muslim friends, Selamat Hari Raya! We’re a few days early but we’d like to wish all our Hindu friends a very happy Deepavali. It’ll be business as usual this Wednesday, 26 Oct 2011, yippeeeeee!